The sky goes by many names, including the celestial sphere, the heavens, and the wild blue yonder. As you know, the sky is not finite like the ceiling of a room. The sky is composed of the atmosphere, which forms an airy barrier between the earth and beyond. The atmosphere is made up of gasses. 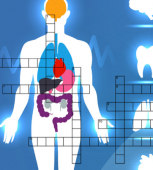 Its main ingredient is nitrogen, but it also contains 21 percent oxygen and 1 percent water vapor. Traces of other gases like carbon monoxide and argon are part of the atmosphere too. These gases absorb the ultraviolet rays of the sun and retain heat to keep the earth’s surface relatively warm. 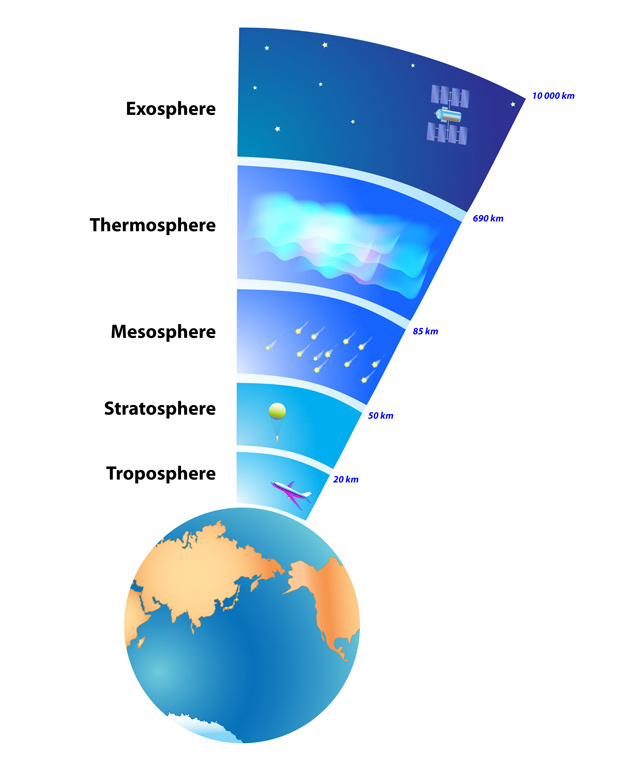 The upper layers of the atmosphere are less dense than those directly above earth. Eventually, the atmosphere thins to the point that it merges with outer space. The standard measurement for where this occurs is 100 kilometers above terra firma, an invisible boundary called the Karman line. Once you venture beyond the Karman line, space extends farther than anyone has ever traveled. It encompasses the moon, the sun, other stars and planets. You would think the sky would be clear, like a window, revealing the universe as far as your eye can see. Instead, when you look upward on a clear day, you see only a breathtaking expanse of blue. It seems logical that the sky should be bright and white like sunlight. However, the white light of the sun is the sum of all the colors in the spectrum. It reaches the atmosphere in the form of energy that travels in waves. Each color has different wavelengths. These are the colors you see when a rainbow appears in the sky. They are also those colors you see when you look at light through a prism. A prism is a geometric object made of glass or clear plastic. In the late 17th century, Sir Isaac Newton first demonstrated how a prism separates waves of light. The prism must have at least two flat surfaces connected by an angle, such as the figure above. 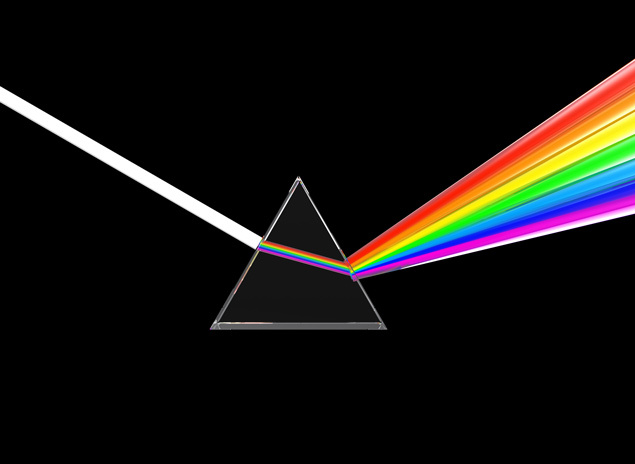 When light shines on one face of the prism, the glass or plastic bends the light, so that when it emerges from the opposite face of the prism, it is separated into different waves of color. The angle of each prism face further separates the light waves so that you can clearly see the separate colors of the emergent light. 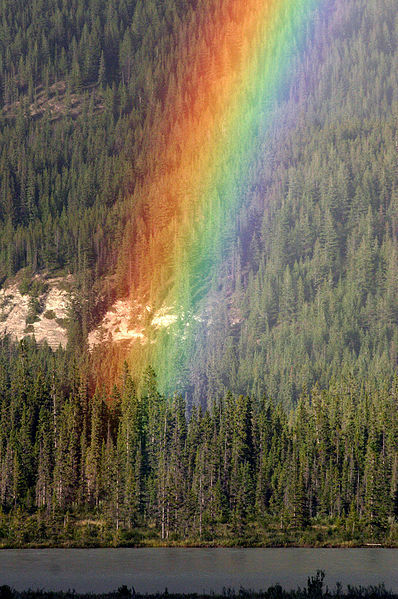 When a rainbow forms in the sky, individual raindrops act as prisms. The water droplets take in sunlight, reflect it within themselves and then refract it. The droplets radiate separate waves of light, forming a spectacular display across the sky. The progression of light is not always continuous. When it shines through a raindrop or a prism, it separates into colors. When it shines on a mirror or the still surface of a lake, it reflects rather than shines through. When light hits solid objects, even ones as tiny as molecules, it scatters. 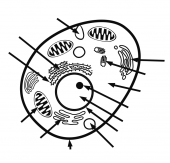 The earth’s atmosphere is filled with various atoms, molecules and airborne particles. The white light from the sun cannot shine through it without scattering. Those colors whose wavelengths are shorter, such as violet and blue, scatter more evenly than colors with longer, more energetic waves, like red, which move more quickly and erratically. 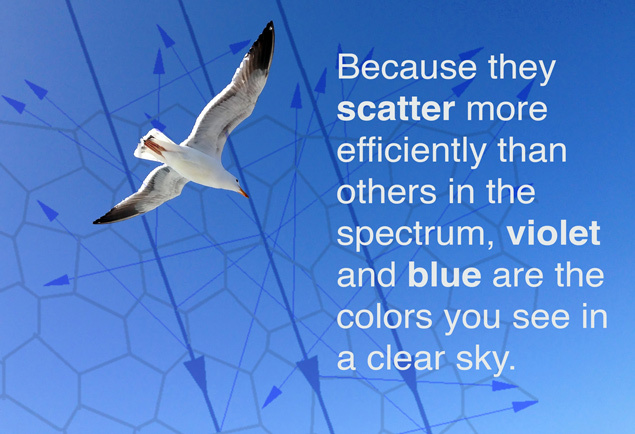 Because they scatter more efficiently than others in the spectrum, violet and blue are the colors you see in a clear sky. The human eye instinctively blends the violet, blue and white light above into a pretty shade that everyone recognizes as sky blue. 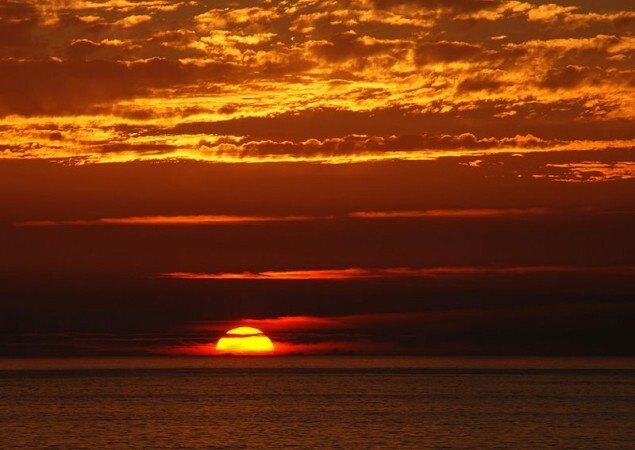 As the earth revolves toward sundown and the rays of the sun stretch across the sky rather than straight down from overhead, they reveal the longer light waves of red and yellow. Just before the sun completely disappears behind the horizon, the blue light waves in the sky above fade into dark, and the colors of the sunset, for a moment or two, became even more brilliant. This is the result of the sun’s rays bending – or refracting — over the curve of the horizon.